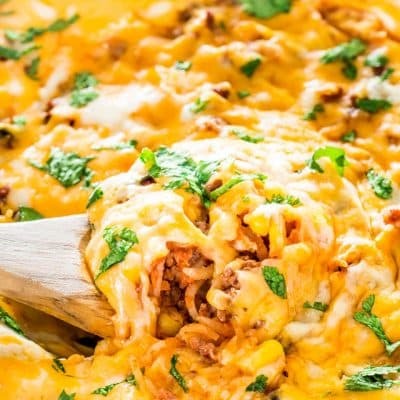 Mexican Beef and Rice Casserole – an easy and delicious beef and rice casserole loaded with flavor and packed with some extra veggies. Oh baby, it’s cold outside. Even on the coldest days of winter the sun is eternally bright in Alberta’s sky, always bringing joy to my heart. But during these long cold winters, even the winter wonderland around me could not bring me out of my hibernating state. All I want to do is curl up on my couch and read a good book. However, every once in a while I do get hungry and those around me get hungry so as it seems sometimes I do have to warm up my kitchen with my cooking and baking. 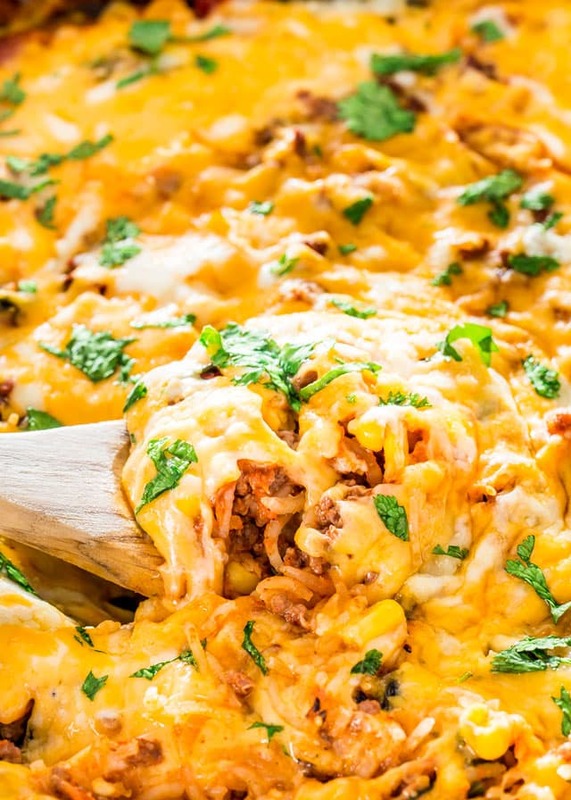 And on these long and cold winter days I love to make casseroles because they last long and let’s be honest, I love a good cheesy casserole. 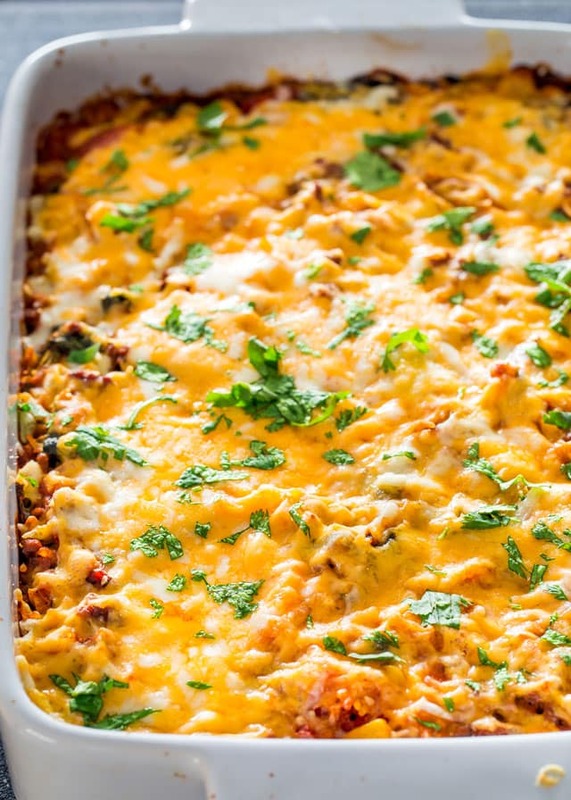 But casseroles are great because they’re a great way to hide those veggies and greens and trick those picky eaters into eating them without them knowing. What they don’t know won’t hurt them, right? 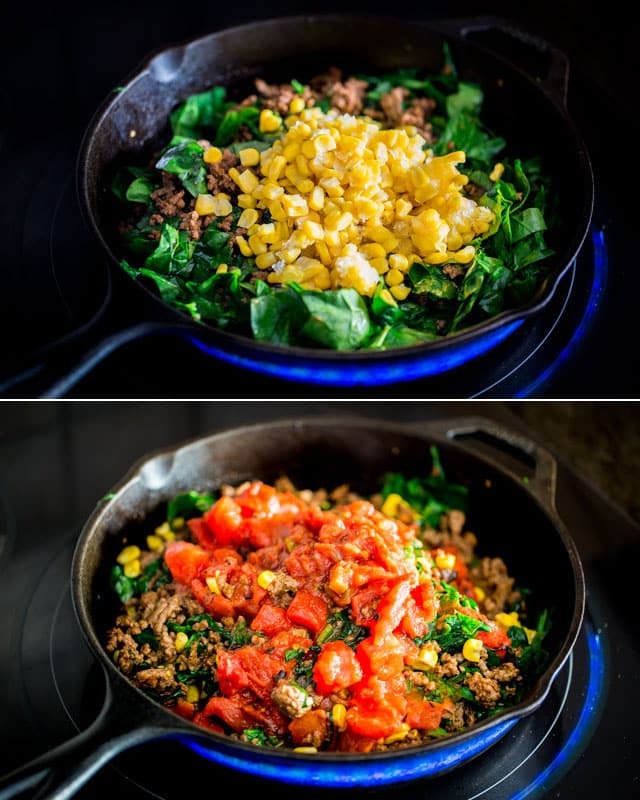 I decided to load this casserole with lots of spinach, corn and an ingredient that has become a favorite of mine, wait for it…. fire roasted tomatoes. 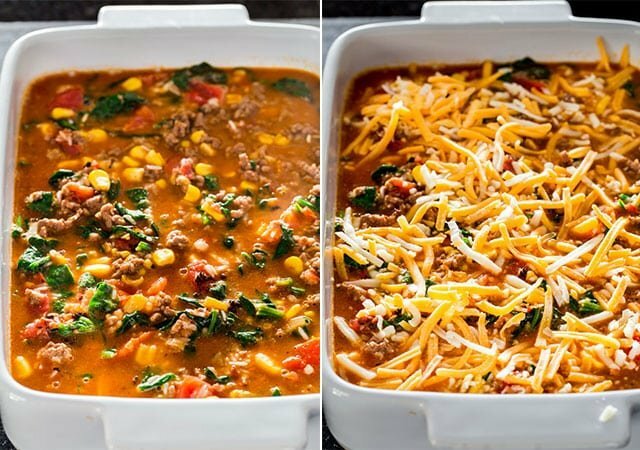 This is a really easy casserole and although I started in a skillet and then moved everything into a casserole dish, you could probably finish this off in your skillet, if your skillet is big enough. I thought it was going to spill in the oven and I abhor cleaning my oven, so to be safe I used a casserole dish. To start the recipe you simply start browning your ground beef until it’s no longer pink and starts to brown a bit, breaking it up as you cook it. I seasoned the ground beef with 1 tbsp of taco seasoning for that Mexican flavor. I buy my taco seasoning in a big jar at my local grocery store so this way I always have it on hand. I added a bunch of spinach to this, which I rinsed, trimmed the ends off and roughly chopped it up. I also added a cup of frozen corn, then the fire roasted tomatoes plus a bit of salsa. You can then add some cheese, I added about a cup of shredded cheese, stir it all together, then add the rice and the broth. You can use vegetable broth, chicken broth or beef broth, doesn’t matter, whatever you have on hand. You can now top it with the remaining cheese and plop it in the oven, or move everything to a larger 9×13 inch casserole dish. I baked this for about 45 minutes, and that should be enough time for the rice to cook. Top this with some cilantro and you’re good to go. You could also top this if you wanted with some freshly chopped tomatoes, some sour cream, salsa, guacamole, whatever you want to make a true Mexican meal like you get at restaurants. But even if you just serve it like this it will be delicious, the rice is perfectly cooked, nice flavors and they’ll never know there’s spinach in it. Try these recipes if you love this one! 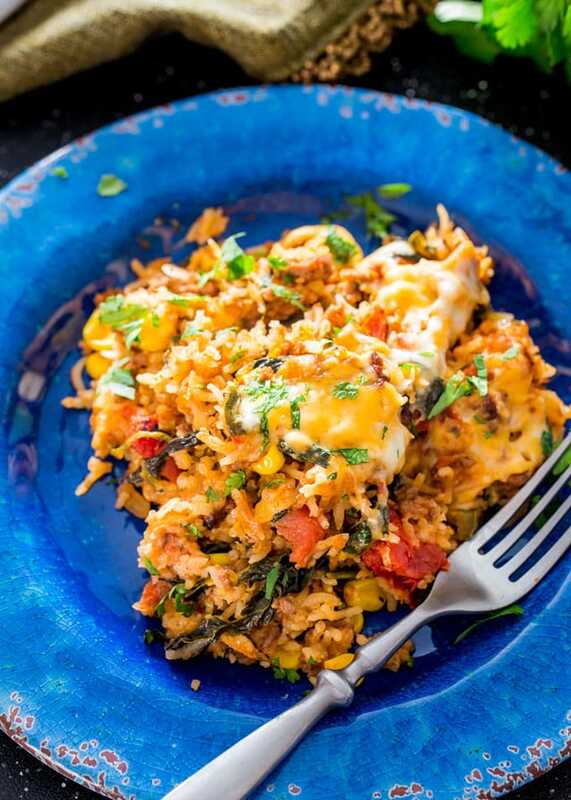 Mexican Beef and Rice Casserole - an easy and delicious beef and rice casserole loaded with flavor and packed with some extra veggies. Preheat oven to 375 F degrees. Spray a 9x13 inch casserole dish with cooking spray. In a large skillet add the ground beef and start browning over medium high heat. Sprinkle the taco seasoning over the beef and break it up with a wooden spoon. Cook until meat is no longer pink and has started to brown, about 5 minutes. 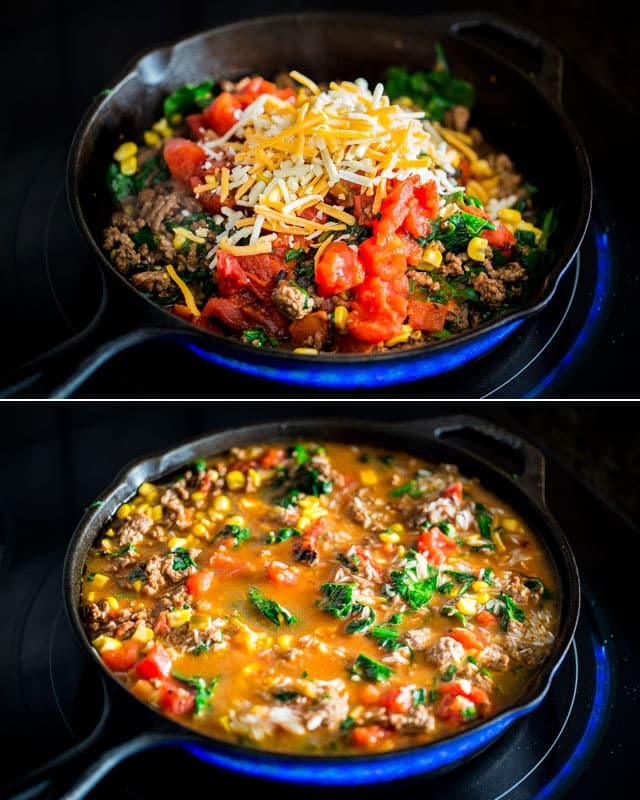 Add the chopped spinach, frozen corn, fire roasted tomatoes, salsa and 1/2 the cheese to the skillet and stir. Add the rice and broth to the skillet and sir well. Spoon everything into the prepared casserole dish and top with about 1/2 of the remaining cheese. Bake for 45 minutes or until the rice is cooked. Top with the remaining cheese and bake for another 5 minutes or until the cheese has melted. To freeze this, cook it completely without cheese and let it cool completely. Transfer it to an airtight container, then just reheat it in the microwave (add the cheese now) when ready to serve. You can use ground chicken, pork, or turkey for this recipe if you'd like. So I LOVE Mexican food and this is such an easy and semi healthy dish! I doubled this recipe, left out the salsa, and added black beans! I of course seasoned burger with fresh garlic and onion. Loved all the colors! I used minute rice instead of long grain because it was what I had in the cabinet. Fingers crossed. Lol it’s in the oven now and looks DELICIOUS. I can’t wait to try it! Thanks so much for the inspiration. Hello…so it’s uncooked rice correct. The rice will cook in the oven? I just popped this in the oven. I’m a bit skeptical that a tbsp of seaonining and a bit if salsa will be enough to flavor it as I envision. We shall see. The fire roasted tomatoes give a fantastic smoky flavor. You’re free to add more seasoning to a dish if you prefer! My 12 year old daughter made this for supper while I cleaned! We didn’t have spinach so I suggested she throw in some kale from the garden. Yummers! The flavours in this dish really pack some punch…We loved it! This was super easy and really delicious. Made it pretty much to the letter. Perfect. I made this for a friend and my kids and they really liked it 🙂 I was wondering if I double this recipe, can I still use a 9×13 size baking dish and cook it for the same time of 45 min? I would probably use a bigger backing dish just to avoid liquid bubbling out and getting the oven messy, but the cooking time will be the same. I doubled this recipe last week for my grandgirls & their respective families. Everyone was happy! Made again today & added a diced zucchini. We love the secret veggies. We have a “take-home Thursday” meal where the littles help make dinner. Thanks for a new fave! Wonderful recipe and so easy to put together. I’m trying this tonight! The recipe doesn’t say to cover the baking dish— but wouldn’t it need to be covered so the rice would cook? Thanks! Can This be frozen & cooked later? If so, what would be the best way? You can freeze it after you’ve cooked (just don’t add the cheese to it yet) it and cooled it down completely. I’d transfer it to an airtight container, then just reheat it in the microwave (add the cheese now) when ready to serve. Fantastic recipe .the combination of ingredients makes this dish Very flavorful . I added a 2 pinches of salt and took away about 1/2cup of cheese, spinach, and the cilantro . And we ate this with some homemade corn chips. Thanks Joanna!! You’re very welcome, so glad you like it! Hi Jo this is delicious. I was looking for a recipe to stretch out our leftover taco mince. I added some onion, peppers and garlic to ours. Thank you for a great recipe that feeds a lot of hungry people ? Just made this tonight! SO good! I added diced onions when cooking the ground beef and added a can of green chilis for some extra heat. I am a big fan and definitely will be making this again! Hi I’m Venessa, I visite your website very often!! I love your recipes very much!! Tonight I made the broccoli rice cheese and chicken recipe!! I just wanted you to know that it is absolutely very delicious and I definitely will make this recipe over and over again!! My husband ate all of it!! I love to cook and I am always looking for delicious recipes like this!! Thanks again, Keep them coming!! I will be definitely be looking for more great recipes!! This looks delicious! Could I make it a few hours early and keep it in the fridge until I’m ready to bake?